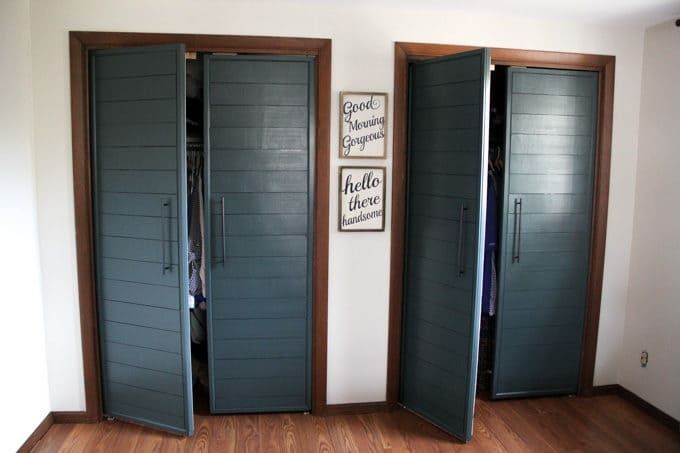 Today I’m sharing our bi-fold to faux shiplap french closet doors! 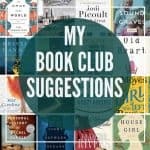 Welcome to Week Three of the “One Room Challenge“! 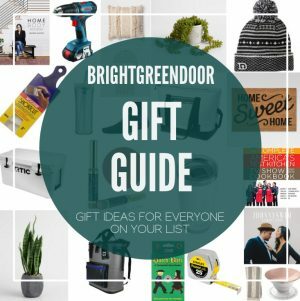 If you’ve been following along you might remember that first I shared the before and mood board, then we painted and installed laminate flooring. In case you haven’t been following along, this was the before. 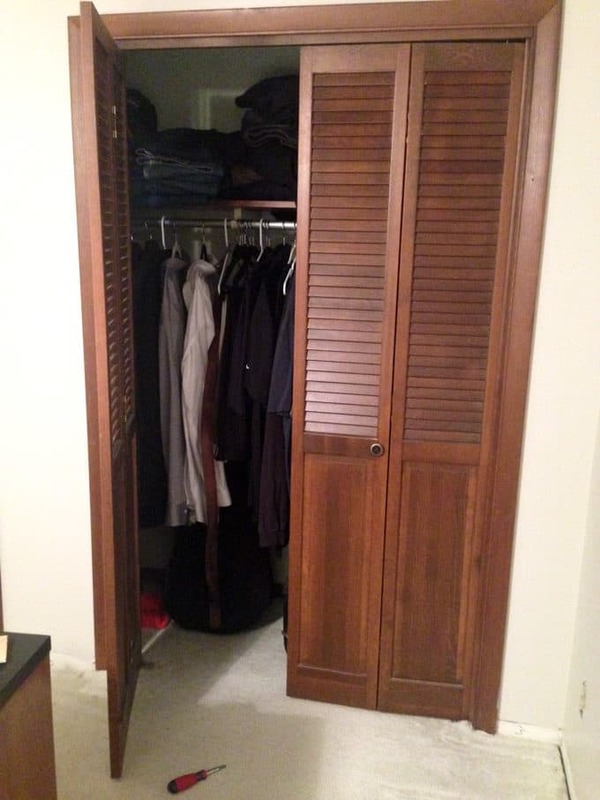 Although the closet doors weren’t awful, it was a lot of wood. Especially after we added the wood flooring. 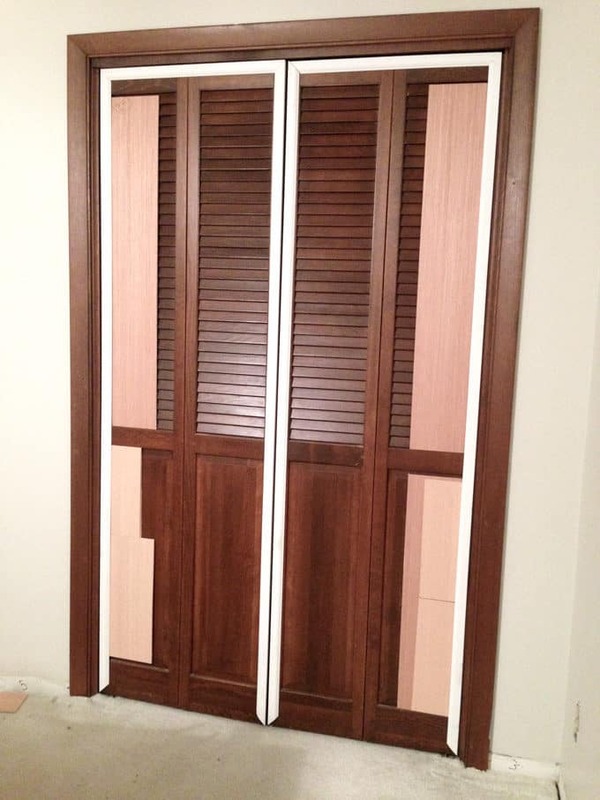 The bi-fold doors also meant it was hard to access the sides of our closet. 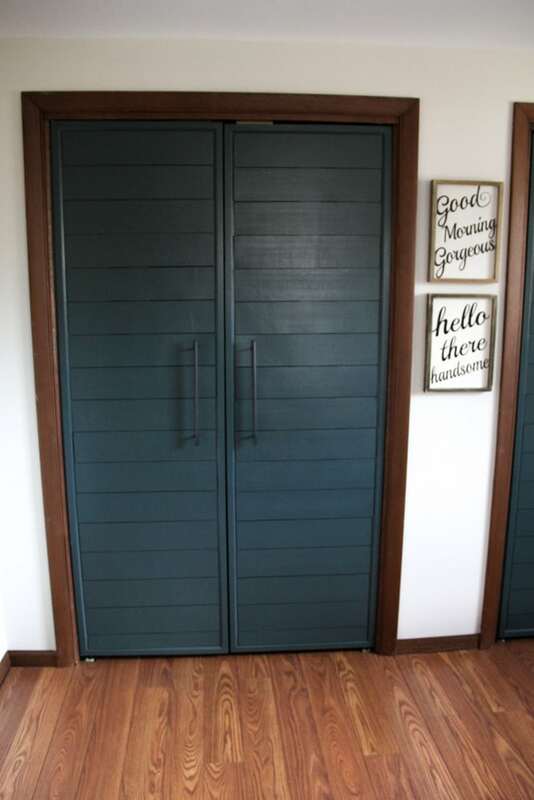 So now that you know how amazing our new french closet doors look you probably want to know how to do it! 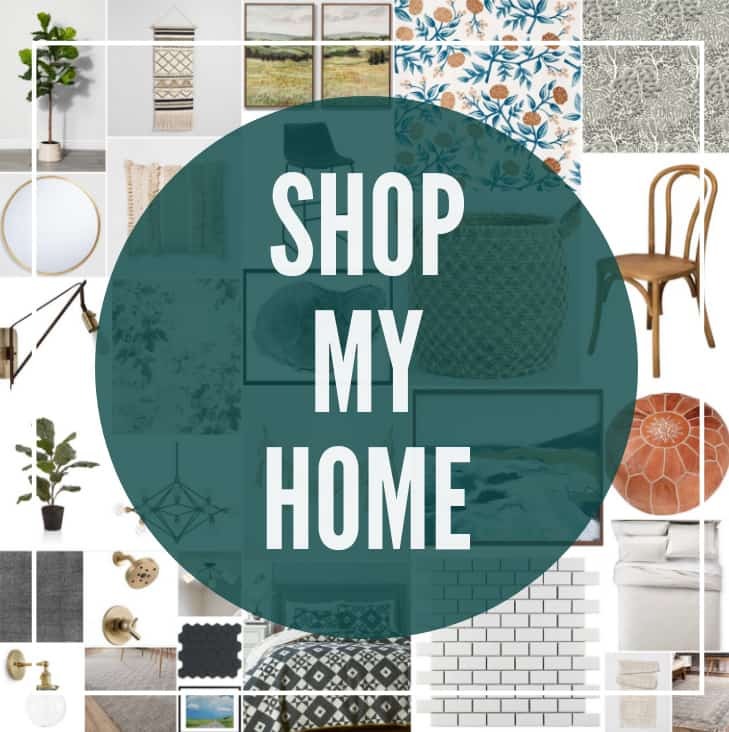 Thankfully, I’m going to share the DIY details today! I started out by taking the door off the hinges and then using a sawzall to cut off the roller that keeps the bi-fold part on track. 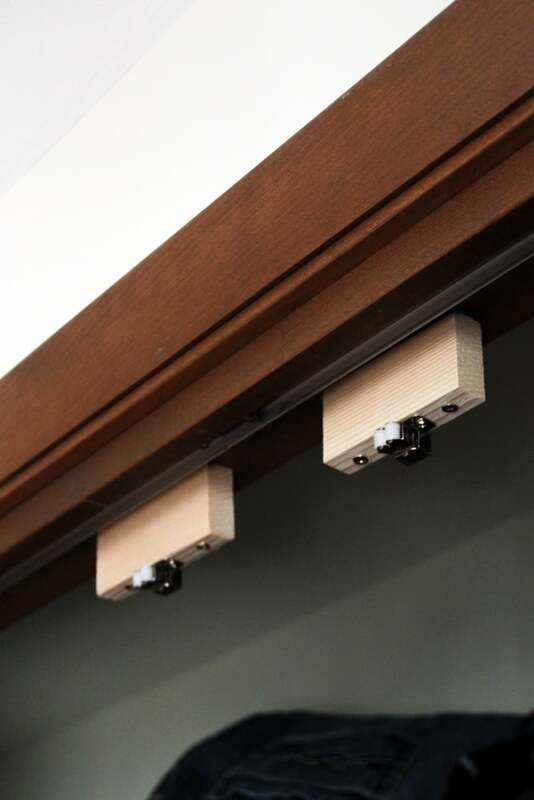 Then I stabilized the bi-fold doors but screwing a metal bracket into the top to keep them flat. 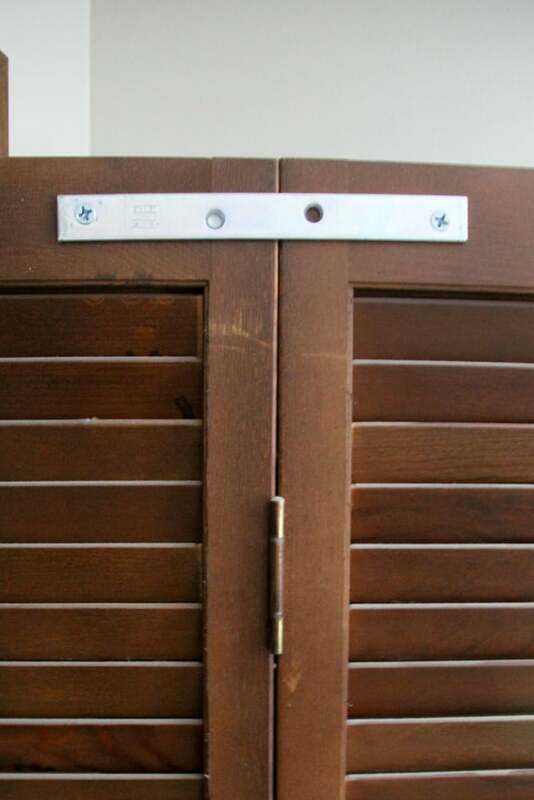 **This post contains affiliate links** Then on the inside I added this spacer and double roller latch. 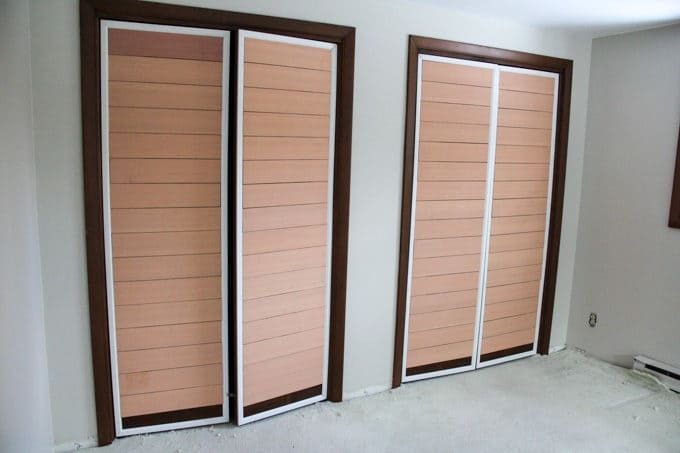 At this point they functioned as french doors. It was really that simple! But I wasn’t going to leave it alone, I wanted to make the doors more modern, and not just like bi-fold doors that worked as french doors. I started by adding trim pieces around the edges of each door. It was important not to get too close to the outer edge or it would get caught when opening and closing. 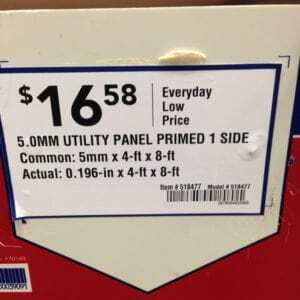 Next I had strips of Plywood cut down into 4.5″ strips at Lowes. Just ignore our disaster garage… we still haven’t gotten fully settled into this house. Even though we’ve been here for almost 4 months! This is the plywood that I used. 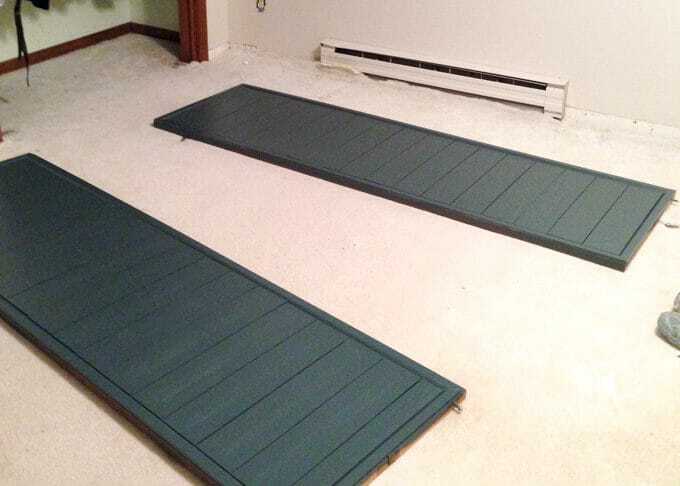 It took three pieces ripped into strips for all four doors. Because of the slats on the bi-fold doors. I had to improvise with my plywood to make a level surface to attach the faux shiplap strips to. A picture really helps this to make the most sense. Then I just started attaching the strips with a brad nailer. I just spaced them out visually, but I’ve heard of using dimes as spacers. When I got to the bottom I had to rip the final 4.5″ piece down smaller, so that it would fit into the leftover space. 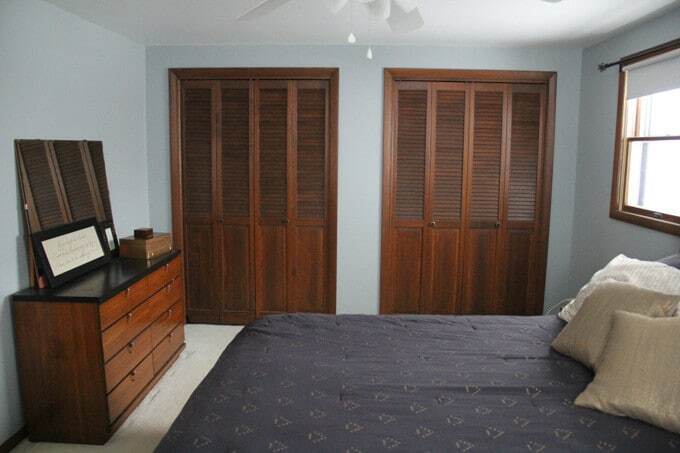 Then I took the doors back off their hinges and painted them with Benjamin Moore “Hidden Falls“. It is such a pretty blue/green color that changes in almost every lighting. 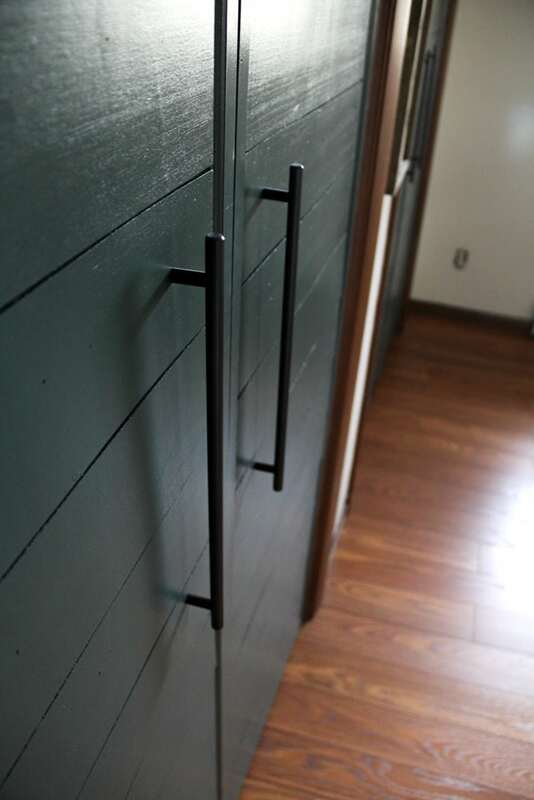 I purchased these pulls online to really modernize these doors. 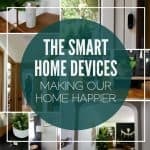 They mimic the ones we have in our kitchen and in our living room built ins. 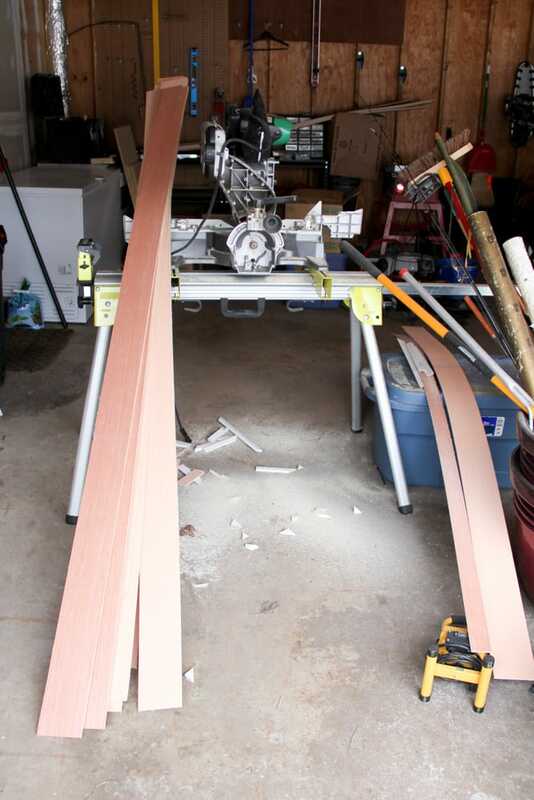 Once the pulls were screwed on, I had additional pieces of plywood cut down for the backs of each door. Before nailing them on I cut the excess brads off. 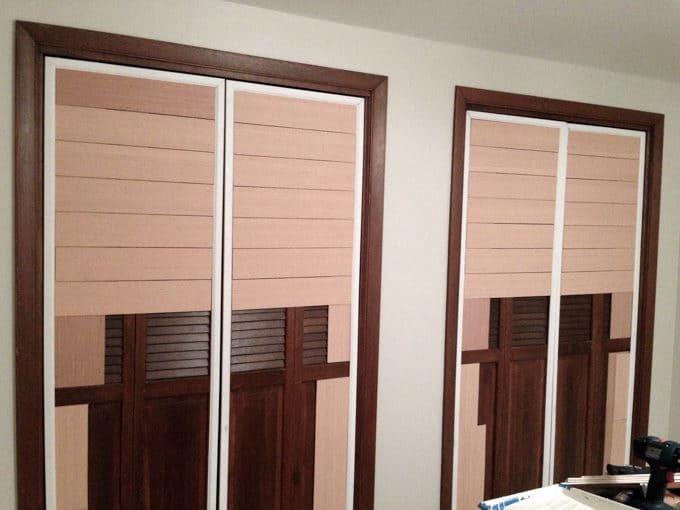 This just gave the door a cleaner look than the backs of the slats with tons of brads sticking through them. 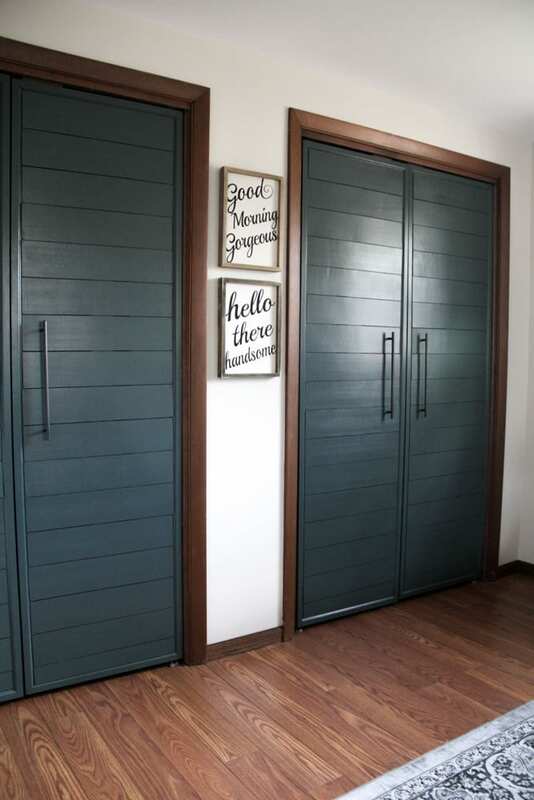 I can’t get over how much I LOVE these doors. I still have to touch up the paint, paint the backs of the doors and paint the latch pieces on the inside. 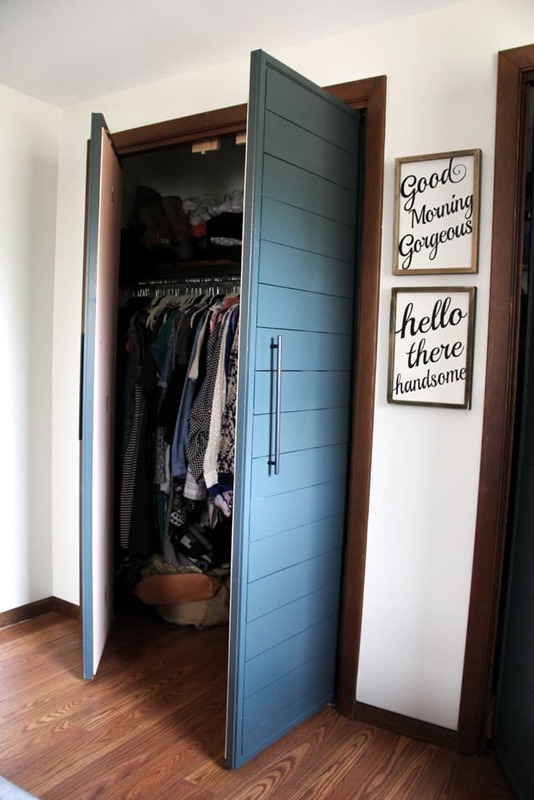 As I look at these pictures I see that I also need to organize our closets! Whoops… a little late on that one! 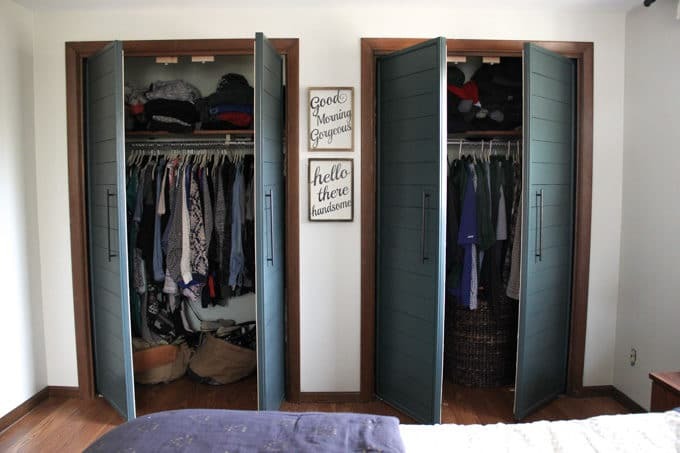 Now when we open our closet doors we’re not battling the bi-fold doors to get to the edges of our closets. They also just look so pretty! I really love the deep color and how it contrasts the wood floors and wood trim. 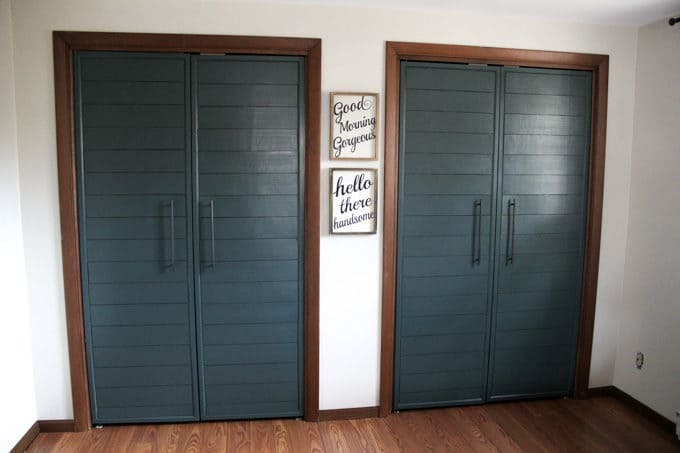 These handles really put the doors over the top too! 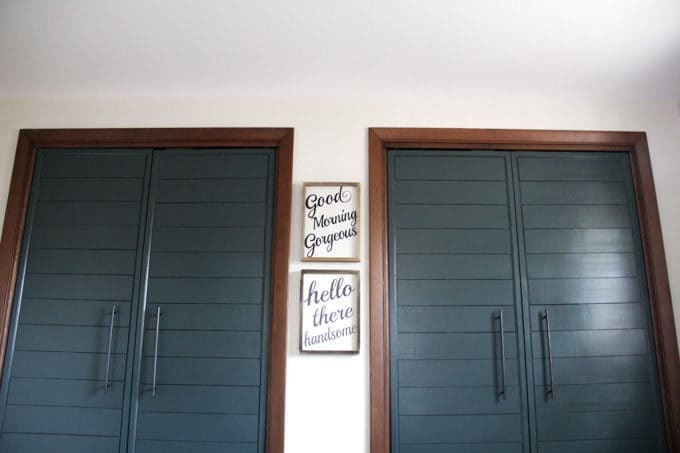 The “Good Morning Gorgeous” and “Hello There Handsome” prints came from Hobby Lobby, and are just the perfect size for between our “His” and “Hers” closets. The rest of the room is really starting to come together, but I wasn’t about to give away too much in only week 3!!! 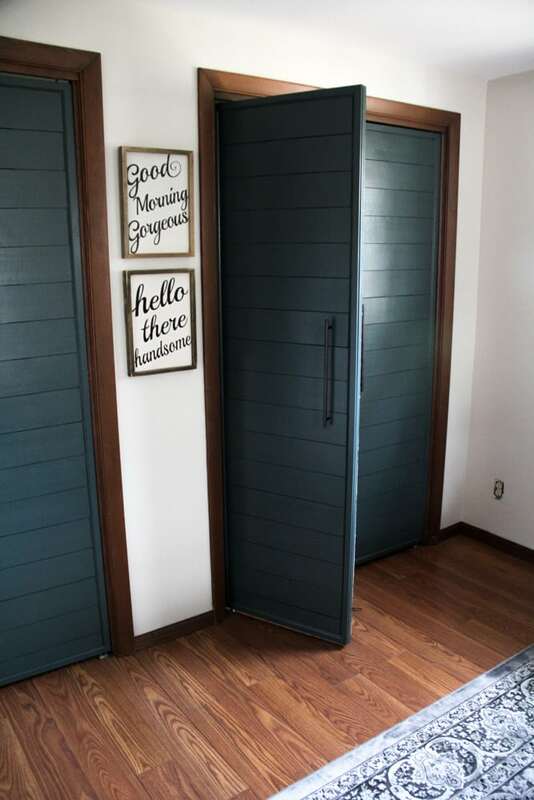 Obviously if you already had the paint it would be quite a bit cheaper, or if you didn’t do the faux Shiplap and just left the doors as is it could be really cheap. In the end though I love the way that these turned out and I think it was worth it. 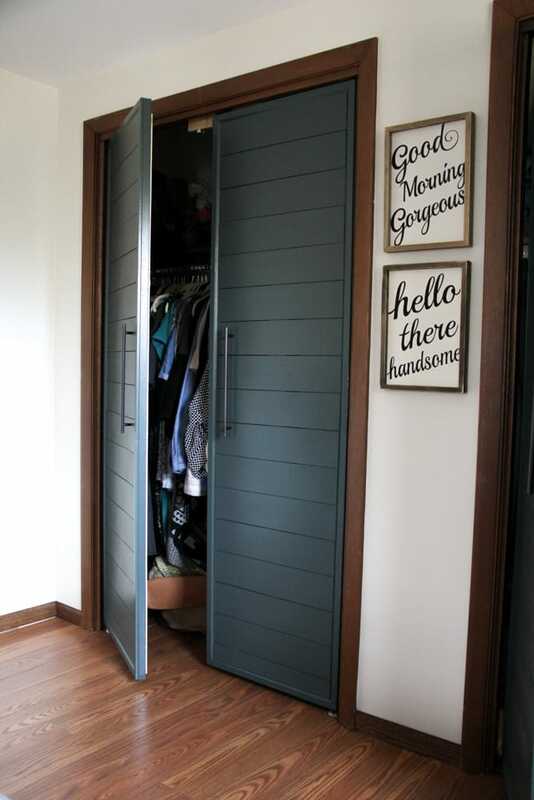 So do you have a closet door that you’re dying to DIY? Or did you just fall in love with this paint color, “Hidden Falls” and wait to use it everywhere?! Either way I so appreciate you being here and reading, and hope you leave inspired to create a home that you love! Really beautiful! 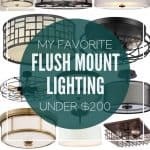 I’ve been struggling with what to do with these ugly things everywhere in my home for years. I’ve taken them on and off – never knowing what to do to make them look better. 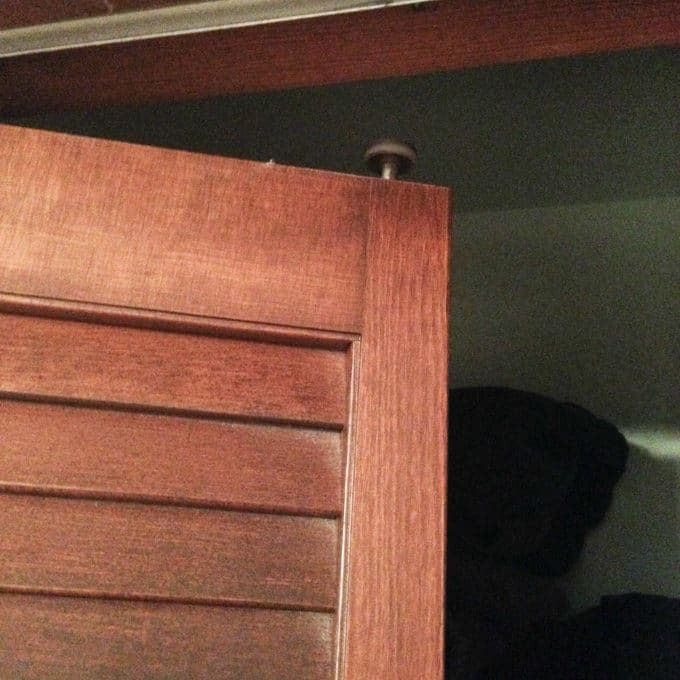 So these aren’t attaches with regular hinges, right? 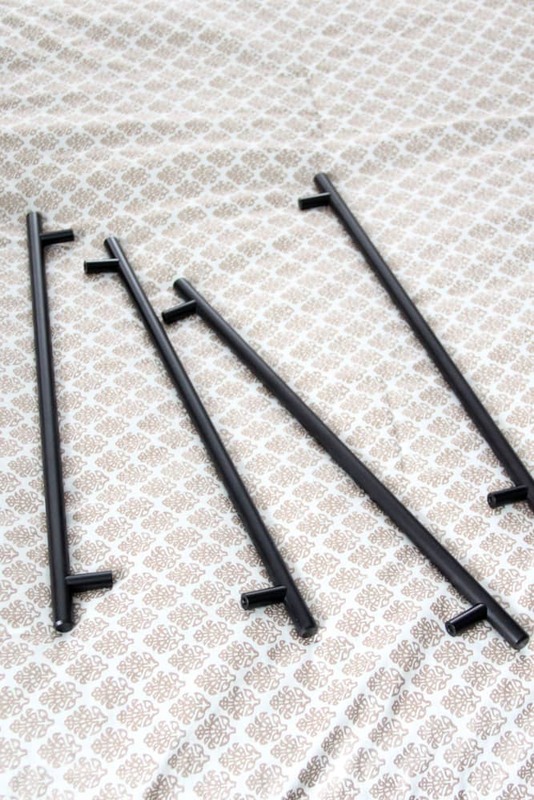 You’re still using the pin that fits into the floor piece and one above into the track? 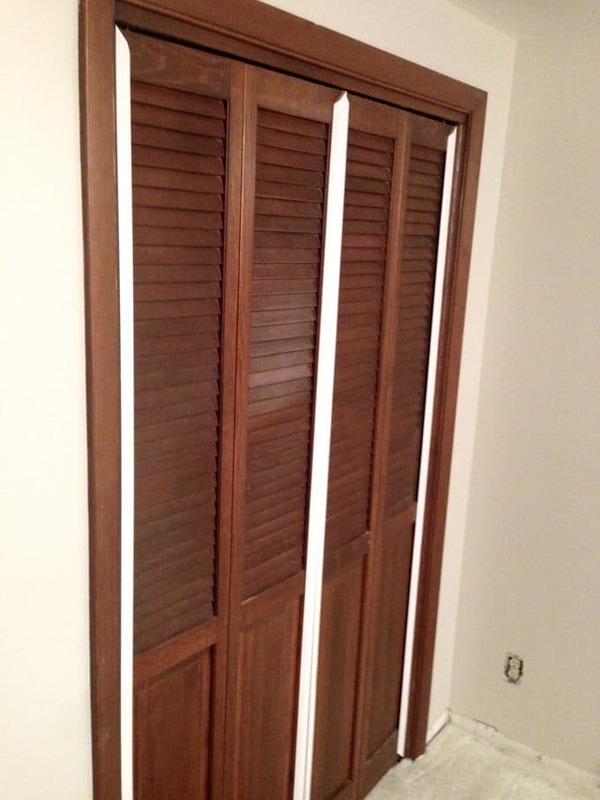 Or did you take all the track and hardware out of the closet frame? 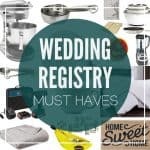 Any way you can send me an image?